This post isn't destined to be the most thrilling- either in photography or content- but I know that we had such a hard time deciding on our menu. I thought this might be helpful! All photos by Thorsen Photography. Jake and I wanted to make the food as easy as possible. Although we truly trusted Calihan Catering, we had been to too many events with seared tuna on a wasabi cracker. We wanted simple, comfort food and that was exactly what was delivered. 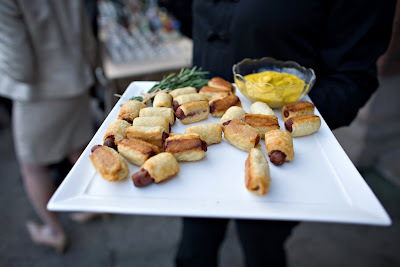 Pigs in blankets, with "fancy" mustard. Jake makes these at home all the time, so it was a sweet, kind of silly homage to his cooking skills. The rosemary sprig really classes it up, no? 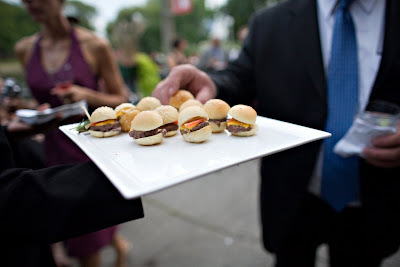 Mini cheeseburgers. These were (according to the red meat eating guests) totally delicious. There was a fresh slice of roma tomato on each burger. We also served pretzel bites with mustard (my favorite) and little slices of pizza. 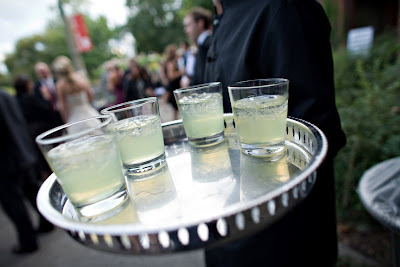 Our signature cocktails were margaritas (my specialty) and Fat Tire Beer. This is where things got a little wonky, and it was one of the few places where one of my vendors messed up. I was told that they were ordering 2 cases of Fat Tire in 30 oz. bottles. Once poured into smaller glasses, that should have been more than enough for everyone to get a taste of our favorite beer and then some. Instead, 2 cases were ordered and the catering staff started handing out bottles. I thought that I had received a bottle because I was special. 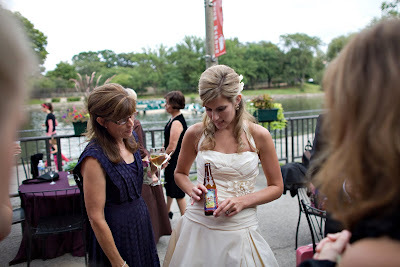 The Fat Tire ran out way too quickly and very few guests even realized that there was a specialty beer. Sad... but not a big deal in the grand scheme of things. My mom was making fun of me for drinking beer out of a bottle. "But Mom, look how pretty the bottle is!" I also didn't realize that they were going to be using icky margarita mix with inexpensive tequila. They look pretty, even without my requested salt. My poor Grampy loves a good margarita and he wasn't able to finish his. I don't have any photos of dinner, but it was yummy! For the salad, we served a small greens salad with a little mug full of yummy tomato basil soup and two wedges of grilled cheese. Aside from a few guests thinking that the soup was salad dressing, it went over really well! The head table could all join the clean plate club. We chose a stuffed chicken breast (they left part of the bone in, keeping it juicier) with sweet potato fries, asparagus and roasted cherry tomatoes. The late night snacks were a hit in miniature form- little shamrock shakes and bite size reuben sandwiches. My dad and I anxiously await those green shakes every year, so it was fun to have them passed on trays during their off season. McDonald's should be on watch! yummy!!!! i make pigs in blankets all the time, too! my husband's friends go crazy for them. i love the comfort food. Everything is looking great and very yummy! i love that you are drinking a fat tire, that is my absolute favorite beer. whenever i go visit my sister in colorado we always visit new belgium brewing!! !